Certificate of Deposit: Good Investment? As funds exceeding my $1K emergency fund, I wonder if they would benefit more from earning passive interest from a CD account. What are your thoughts? Flipping through my emails I am starting to pay more attention to Interest Rates for various financial vehicles. One area is Certificate of Deposit Accounts. My Emergency Fund is only earning a 0.25% dividend rate (on balances over $150). The rate not so good, but the quick availability of funds is good (for an emergency, right?). (I’ve taken a like to Ally. There website is ultra user friendly – makes me a happy camper to use them as an example in my posts). If I start with an initial investment of $1,000, I stand to earn $40.81 in 2 Years. “Not a lot”, you say. But isn’t it better than earning $5.01 in my current savings account? With our Raise Your Rate CD, you can call Ally for a one-time rate increase if our rates go up any time during your 2 year term. Plus, with our Ally Ten Day Best Rate Guarantee, when you fund your CD within ten days of opening or when your Ally CD renews, you automatically get the best rate we offer during those ten days. Most banks offer only one rateâ€”the one you get the day you fund. We don’t require a minimum deposit. Most banks do. Always be sure to check their fine print before choosing the right product for you. When you withdraw money from a CD before its maturity date. You will usually be charged a fee for an early withdrawalâ€”unless you have our No Penalty CD. This entry was posted in Finances and tagged high yield certificate of deposit, online certificate of deposit on 2010-03-17 by Christine. I am just starting on the emergency fund and once that is an $1k or so it’s off to the savings… My money is in England so not sure what options I have but I will look into it. If you follow Ramsey’s schedule, than greater than $1000 would go to speeding up your snowball payments. So, you may not need the CD right now. So, I guess that is another option for me – put that $ towards my debt – as I am paying more in interest there. I’m in an interesting situation with my debt now. The debt management plan I am in means that all interest and charges are now frozen…. This means no incentive to pay more than the minimum as it makes no difference. Also paying more than the minimum will lead to the minimum being risen as it’s based on your budget and spare finance. I’m going to concentrate on savings until I have enough cash to settle all the debts straight up…. Could take a while but makes more sense as I can earn cash on the interest rather than paying extra to debt for the sake of it. I still need to read up on Ramsey…. I keep meaning too! Have you tried ING at all (with any type of account)? Wonder how Ally and ING compare. I’m uncomfortable with the idea of a cd now. I wonder how much money would make me feel secure, lol. I have to switch banks in June anyway, something to give a thought about. Being ‘locked’ into a time commitment with your money can be scary. I like what evolotion of wealth says below about a high yield interest savings account. I have seen both ING and ALLY have pretty comparable rates. I also need to look at my CU rates. They can be pretty nice, too. How is the planning going for your move?? Have you looked into high yield savings accounts? That would give you the same liquidity of a regular savings account except it might be at a bank that isn’t as convenient as the one down the street so there might need to be a transfer involved. Still quick though. Or is this just a post to promote Ally’s CDs. Oh, that is another option. I didn’t think about that. With interest rates being low across the board, you could probable get a comparable rate to a CD. Thanks for your input. No, this is not a direct ally promotion. I just like using them as an example. They have a great web format to use for presentation. Agree with Evolution of Wealth. Look at HYSA online. There are a number out there that still offer anywhere between 1.25-1.5% *If I recall the March #s correctly. Your primary concern should be the liquidity. Is Ally the one that allows you to withdraw at any time without penalty? If this is your emergency fund, then you need them to be readily available for when you need them. I love your ‘them’ reference. I also agree. With the amount of money and I assume this is your only savings, it should be very liquid. Rates are so terrible that tying your funds up in a CD for years makes no sense. I mean, what if rates get better? You’re stuck. I think you shuld look into something that is much more liquid. What about investing in a peer to peer loan? Seriously? You are going to compare peer to peer lending to CDs and high yield savings accounts? I’ll read that post if you right it but I can’t imagine comparing apples and bananas will allow you to ask that question again. Sorry. It just popped in my head. I was just thinking that a 9% return for investing on a 3 year loan might be something to consider. For another day, then. As much as I like and invest in P2P, I don’t think it’s wise with the amount of money you are talking about. If this was less than 4% of your emergency fund I would say sure! Some CDs will give you a one-time bump in rate. Something to consider. Also, check out banks with lower CD amounts. You can “tie up” money but still have CDs coming available once every couple of months or so. 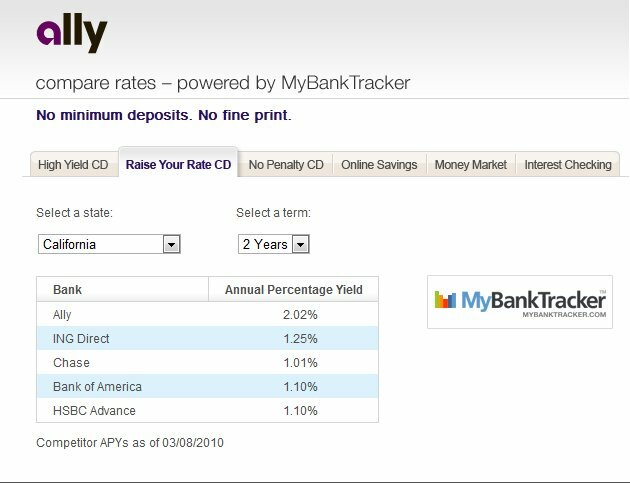 The Ally 2 Year Raise Your Rate CD does let you bump it up once in those 2 years. And the interest rate is higher than most banks. That is my thought about investing some here and then later investing some later… A combination of CDs to hopefully bring about a decent rate of return down the line. As Sam mentions, along the lines in his article, about holding a lower percent CD with a higher percent CD to give you a decent average rate of return. Wow, that’s really cool – I never heard of the ability to “bump your rate” before. Although I don’t have the saving to do it now I do want to eventually ladder my excess savings in CD’s but the dismal rates are off putting. I swear in 2007 my savings account was earning close to 4.5% interest! I’ve only heard of CD’s, but never taken the time to invest in them. My philosophy is I have a stash of cash for emergencies that I don’t have locked up in any way. And the rest gets dumped into stocks/mutual funds/businesses/real estate, etc… to try and grow. No need to be sorry. It’s a valid question. And I would believe you do get a debit card for that type of thing. It sounds like there are better things than for me to invest in besides CDs. Ah, one day I would like to invest in Real Estate. CDs bore me and I think the liquidity of a savings account would be a safer bet. Have you considered Lending Club for higher rates? As much as I’m a big fan of Lending Club (in fact just did an update of my loans), I wouldn’t recommend if this is her only savings. Much too risky. I would only do up to 5% of your total emergency savings. In order to get any meaningful return, that would be a few thousand. Love the feedback! Thanks, boys! I did consider LC, but like Investor Junkie says… I would need a few thousand to make a difference.